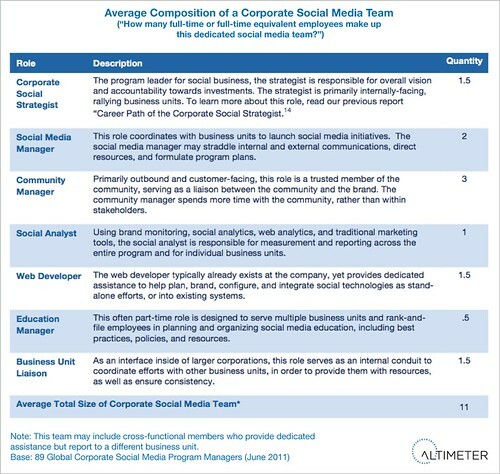 How are today’s social media teams structured? Ever wonder who’s behind those corporate Twitter and Facebook accounts? Think there’s more to it than an intern just tweeting haphazardly? Leadership Team: We found 1.5 folks are focused on leadership and vision, the most common title is the Corporate Social Strategist, and we published a research report discussing the aspirations and challenges of this Open Leader, and how they organize internally. They are primarily focused on the overall program ROI, and are internally focused to drive business results. This role is a requirement, even if it’s a part time role. Market-Facing: Three three community managers are facing customers, and serve as a go-between to balance the needs between customers and the corporation, I’ve written at length about these important professionals, see all tagged posts. These units are key for customer interaction, but in the end cannot scale and will shift to advocacy or enable customers to respond to each other. Program Management: We found 4.5 are in program management (developers, analytics) that keep the ship growing by running programs often at the corporate level like the social media managers, the analyst that’s conducting reporting and brand monitoring programs, and lastly the developer teams, which get systems to work. As a corporate resources serving spokes, these roles are key, esp as data needs to be aggregated for business intelligence. Company size changes team headcount –yet ratios likely stay same. 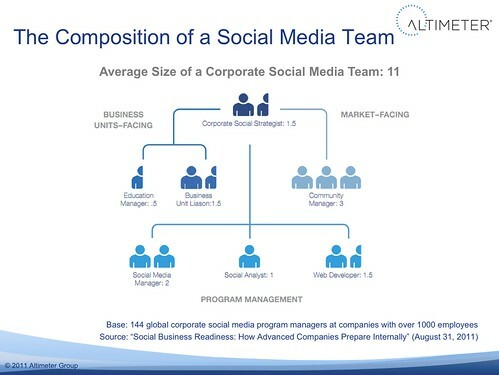 This is an average, so the changes of you having exactly 11 folks is not likely, chances are your company is larger or smaller than this average –and your team size will vary. In fact, this is often a cross-functional team, as a majority of companies are in the hub and spoke or dandelion models. In fact, if your company is smaller, you may be wearing multiple hats –but we should expect the ratios of the roles to roughly average out, all things equal. Mature programs shift to empowerment, changing team dynamic. We’ve sorted data by maturity in previous sample sizes, and know that in 2010 the team sizes were a little under 4 for novice, about 8 for intermediate, and could get up to 20 for mature programs, read the report on budgets and team sizes. You should expect similar modeling to occur in all corporations. Furthermore, we’ve seen trends that more advanced companies will have more business unit liasons to empower teams, and reduce their core community managers as the conversations move the edges of the company. Thanks to Christine Tran, Senior Researcher at Altimeter (and part-time tomato farmer) for work on surveying brands, analysis, and collating data for this graphic. If you’re in one of these teams, I would to hear from you, what your team size is, composition, in the comments below. Update: Here’s a related graphic detailed the team roles and descriptions, all from the report on Social Business Readiness where the data above is from.